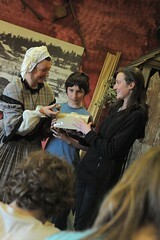 During the Christmas school holiday period this year Sovereign Hill has focussed on some of the strange but true stories of the Ballarat gold rush period. These have included stories about a deep sea diver, zebra, tiger and diggers dressed as women. As entertaining as these weird and wonderful stories have been, we must remember that as a museum it is our responsibility to be as accurate in our portrayal of goldfields’ history as possible. 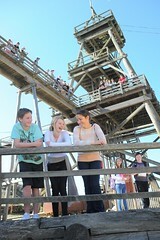 For that reason all of these activities had to have some basis in fact, and this makes the stories even better. 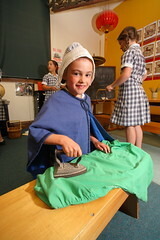 In this Blog we will explore two of these activities and the amazing true stories that they are based on. 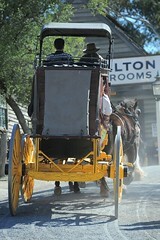 Sometimes the animals brought to the goldfields could be quite difficult to handle. 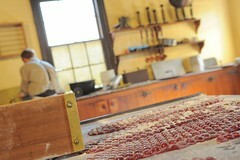 The Bengal Tiger on display at the Montezuma Hotel in Ballarat around August 1855 is an example of this. Transporting dangerous animals was not handled as carefully as it should have been. This can be seen from the story in the anonymous Diary of a Miner Working on the Ballarat Goldfields (1855 –1856) and this report from The Argus Tuesday 14 August, 1855. 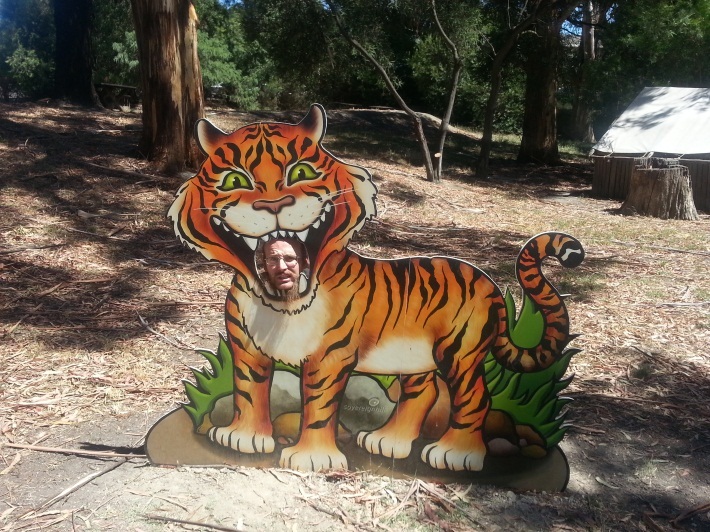 Staff member Ben with his head in the tiger’s mouth. A very funny story if you weren’t there at the time, but terrifying if you were. 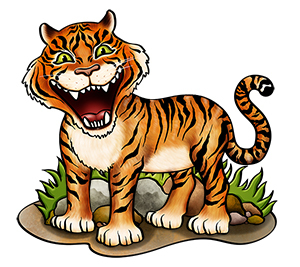 Don’t worry, our tiger won’t hurt anyone, except our staff member Ben, who seems to be tempting fate. 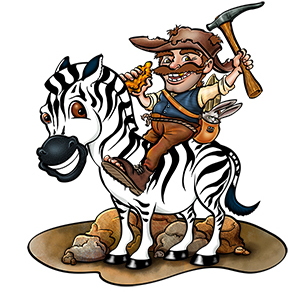 Believe it or not, there were many cases of exotic animals on the Victorian Goldfields, including zebras. Entertainment venues, such as theatres and hotels needed an attraction to entice customers into their establishments. Exotic animals were one way of doing this, either on their own or in miniature zoos called menageries. An article from the Ballarat Star in August of 1859, states that two zebras were on display at the Criterion Hotel in Ballarat. They could be viewed for the cost of one shilling. 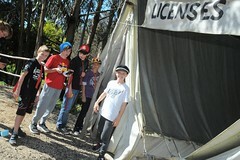 Our school holiday program focuses on the two stories you have just read. But there are more stories about animals we haven’t covered here. 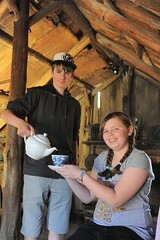 You may like to read about the elephant that visited Geelong or the elephant that didn’t like the dogs on the diggings. We have also researched the case of the drunken horse, a sheep crashing through a shop and the snake in a mine, all stories that we may elaborate on in future posts. 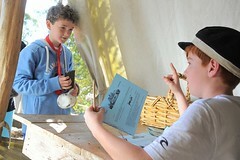 For now we have given you links to begin your own research into these great stories. Fake Mermaid. Gold Museum Collection. There were several other attempts to bring animals and menageries to the colonies. Sometimes con men who couldn’t locate an exotic animal simply created one. 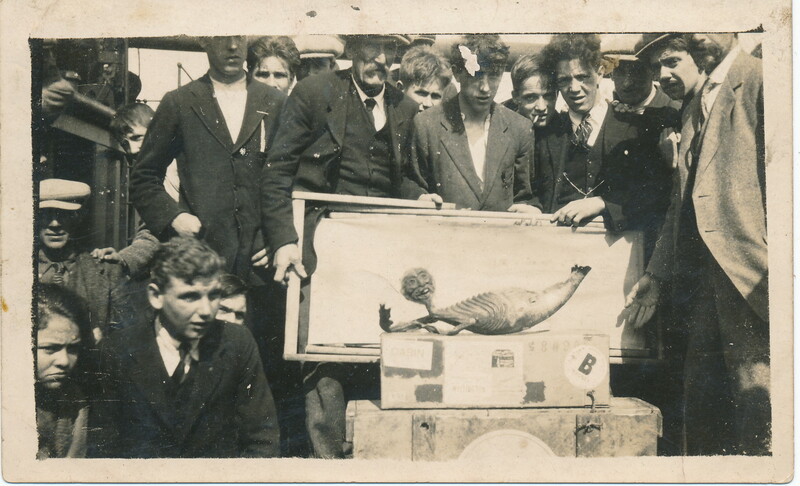 Our Gold Museum has a photograph of an apparent “merman” which you can read about in their blog. The inspiration for these stories came to us from a wonderful book by one of our favourite authors, Doug Bradby. 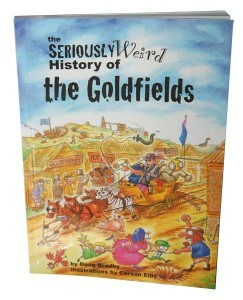 The book is “The Seriously Weird History of the Goldfields”. It is part of Doug’s “Seriously Weird” series of books, which cover democracy, the ancient world and the history of Australia. We highly recommend these books, either in the classroom or just as a great read for history buffs like us. If you would like to read more about the series, read our previous post. Thats our stories about animals. If you liked this post, try our post on weird and wonderful people. 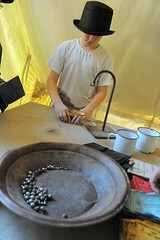 This entry was posted in Victorian Gold Rush and tagged 1850s lifestyles, 1850s people, Ballarat, entertainment, historical recreations, history for kids, local history. Bookmark the permalink. Glad you enjoyed it. Hope the kids get a kick out of it too. Book is readily available, let us know if you have difficulties. Thanks for the comment.